My friends I think we have to be mindful that we are not better than God. We can center ourselves in the center of all that is …God… then we can realize that the things we place our hopes in are not better than God. There is no real wisdom in the objects, people, places or things that we make the “God” of our existence. Are we fools for God? Does anything matter more to us than God? In the same way as Jesus and many other prophets, nothing else mattered but God. Of course things in our lives have their places of importance, but do we make these things in our lives greater God? So when the walls that separate us from God are down and we forget how perfect we have acted in front of certain people, do we then see all that really matters? Can we delight in being in the presence of God playing with us, cheerfully at play with all of creation? It usually is customary when a person enters into a monastery and begins their life as a monastic, that the novice is usually directed by the novice master to remember to have fun along with their journey of faith. Of course the times of prayer, work, and study accompany the novice, but to have fun and remember to be cheerful. Ah, that is a vital ingredient in the training that the novice would need. Do we allow the wisdom of God to enter us, remain and play with us? How foolish do we have to be? In the parable that Jesus told, I like to think that God would have come out for the other attendants who did not have enough oil for their lamps. We may miss things like the attendants who forgot to buy enough oil. This is a lesson in remembering to be prepared. But God is ever taking care of us and sending moments of joy, a joy that happens with grace as we allow the divine creation to enter into our very beings. Sometimes we will not be ready, but I like to think it all gets balanced out in the end. Has our foolishness prevented us from seeking the wisdom of God? In our journey in the Christ consciousness are we fools for Christ? Are we falling asleep? How are we prepared to meet God in the moment? Do we allow God to be God and take care of us? 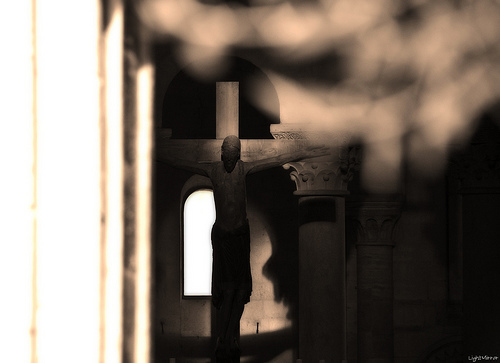 Reflection on the gospel reading: We are not usually conscious of it, but there isn’t a moment that goes by where we are not making a decision about who we are. A Jesuit spiritual writer who lived in the eighteenth century, Jean Pierre de Caussade, considered the present moment to be a sacrament, because every moment presents an opportunity to meet God. Every moment offers a choice for us to decide who we are in this moment, and the decisions we make, the things we do right now, are how we create the person we desire to become. 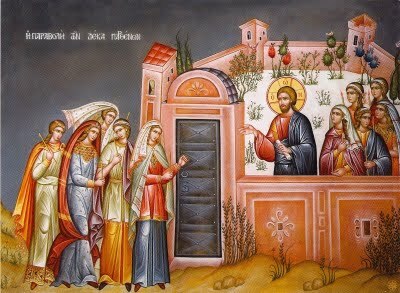 In today’s gospel, 10 virgins spend their time in preparation to meet the Bridegroom, and 10 virgins wile away their time. Life certainly requires time to relax and divert ourselves, but it is a project, and the cumulative effect of the choices in all the present moments through which we pass will leave a product at the end of our lives. Living as though God exists is not a thought process–it is a specific way of being oriented in thought and action to the present moment. 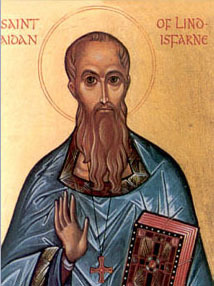 Saint of the day: Irish by birth, Aidan was a monk at Iona, Ireland. His name means, “fire.” Aidan studied under Saint Senan at Inish Cathay. He was bishop of Clogher by Ware and Lynch. He resigned the see to became a monk at Iona in about 630. He evangelized Northumbria, England as a bishop at the behest of his friend the king, Saint Oswald of Northumbria. Once when pagans attacked Oswald’s forces at Bambrough, they piled wood around the city walls to burn it; Aidan prayed for help, and a change in wind blew the smoke and flames over the pagan army. Paul acknowledges the gifts of others as well as his own bestowed by God. There is no jealousy of each others’ gifts, and this frees him to do God’s work. Sometimes we become intimidated by others’ gifts, comparing them with our own, and this turns to jealousy. When we are jealous, we are no longer doing what God is calling us to do through our own gifts. We tend to become comfortable with our gifts and stop using them and we are embarrassed to talk about God to certain people. St. Paul reminds us to constantly be in the spirit of thanksgiving for our entire lives no matter what the present situation. Praise and thanks is the key to joy. Do our actions match our words? Are we living a life of peace and justice, being fair to all? Do we give others an invitation to meet God by who we are, not just by what we say? It is so important to be aware that the Divine is in every person, not just the persons we feel comfortable with. As St. Francis of Assisi said, “Go preach the gospel and if necessary use words”. Jesus said to his disciples: “Stay awake! For you do not know on which day your Lord will come. Be sure of this: if the master of the house had known the hour of night when the thief was coming, he would have stayed awake and not let his house be broken into. So too, you also must be prepared, for at an hour you do not expect, the Son of Man will come. Reflection on the gospel reading: Our readings from the gospel of Matthew are coming to a close. They continue for a couple of more days, and then on Monday, we move on to read and reflect on the gospel of Luke. 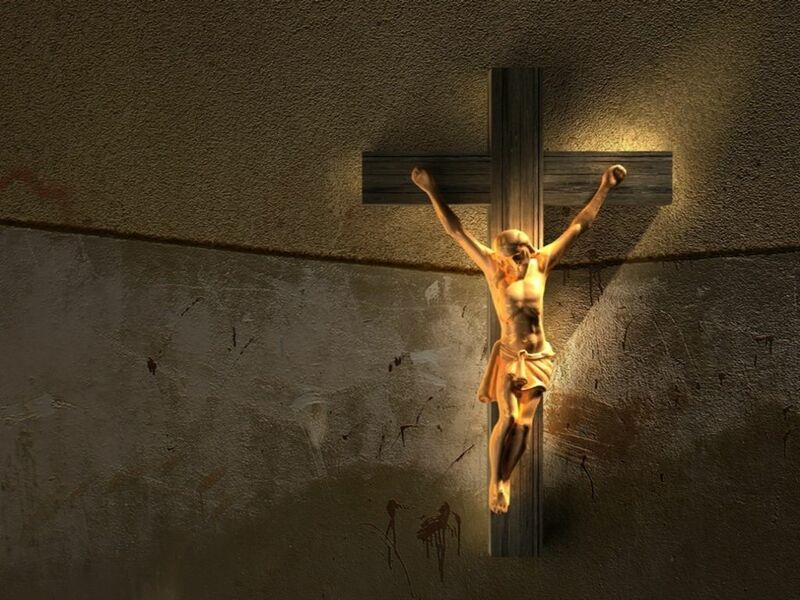 But today, Friday, and Saturday, we have certain selected Matthean passages from Jesus’ sermon about the last things. The reading today overtly suggests that the Lord is coming at a time we cannot know; the subtext is that the wise policy is to live our lives in anticipation of the day and hour of the Lord’s return, a time that is hidden from us. There are different ways to learn from this passage. Of course, we can understand this reading in the context of the Lord’s second coming at the end of time, but isn’t one of the lessons of Christian life that the Lord is ever at hand. Living our lives in anticipation of Jesus’ return is not just living for the end. It is also living for the moment, for we know from our experience that the Lord is in our midst at every instant. Lives lived in gentleness, kindness, and mercy are lives lived not to encounter the Lord at some remote hour but to open ourselves to find him right here, right now. 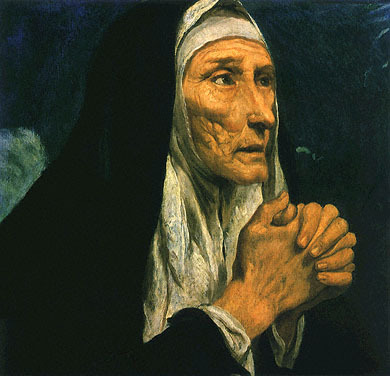 Saint of the day: Margaret Ward was born in Congleton, Cheshire, England. Nothing is known of her early life. Margaret worked a lady’s companion to the Whittle family in London. She and her servant, Blessed John Roche, were arrested for helping Father Richard Watson escape from Bridewell Prison by smuggling him a rope and then helping him once he was outside. Imprisoned, flogged, and tortured, she was offered freedom if she would surrender Father Watson and convert to the Church of England; she declined. She was hanged, drawn, and quartered on August 30, 1588 at Tyburn, London, England. Putting God first is not a sacrifice. Why do we let negativity influence us? Thinking putting God first in our lives means we will not be free? Why do we think by putting god first it means following a bunch of rules that bind us? Jesus addresses that negativity when he reprimands the scribes and Pharisees for their hypocrisy. They put so many burdens on the innocent people making them think they would not be close to God unless they obeyed those false rules they created (not God). We need to listen to that inner voice telling us by putting God first we will be free to live a life of joy, peace, hope, and love. Yes, there are guidelines, but we follow them because we are so in love with God we enjoy whatever the guidelines are. God Bless! Herod was the one who had John the Baptist arrested and bound in prison on account of Herodias, the wife of his brother Philip, whom he had married. John had said to Herod, “It is not lawful for you to have your brother’s wife.” Herodias harbored a grudge against him and wanted to kill him but was unable to do so. Herod feared John, knowing him to be a righteous and holy man, and kept him in custody. When he heard him speak he was very much perplexed, yet he liked to listen to him. She had an opportunity one day when Herod, on his birthday, gave a banquet for his courtiers, his military officers, and the leading men of Galilee. Herodias’ own daughter came in and performed a dance that delighted Herod and his guests. The king said to the girl, “Ask of me whatever you wish and I will grant it to you.” He even swore many things to her, “I will grant you whatever you ask of me, even to half of my kingdom.” She went out and said to her mother, “What shall I ask for?” She replied, “The head of John the Baptist.” The girl hurried back to the king’s presence and made her request, “I want you to give me at once on a platter the head of John the Baptist.” The king was deeply distressed, but because of his oaths and the guests he did not wish to break his word to her. So he promptly dispatched an executioner with orders to bring back his head. He went off and beheaded him in the prison. He brought in the head on a platter and gave it to the girl. The girl in turn gave it to her mother. When his disciples heard about it, they came and took his body and laid it in a tomb. Reflection on the gospel reading: About John, of course, Jesus said that no greater man had been born of woman. 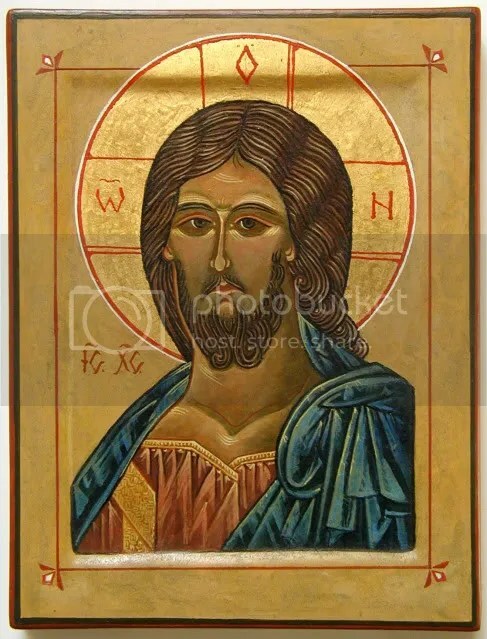 And in John, whose passion we recall today, we see the typology of the life of the Lord, a Lord whose sandals’ thongs John said he was not fit to loosen. As an angel does with Jesus’ birth, an angel announces John’s birth. While the Lord is born miraculously to a virgin, John is born miraculously to an older woman. The pattern of Jesus’ ministry to announce the inbreaking of the kingdom of God mirrors the pattern of John’s ministry to announce repentance to Israel. And John’s unjust murder, the subject of today’s reading and feast, prefigures our Lord’s unjust murder. Of course, there are many elements in our lives that cannot fit the outlines of the narratives of either Jesus or John, but we can choose to live as they lived, close to the call we, like they, receive from the Father, lives lived out empowered by the grace of the Holy Spirit of God. 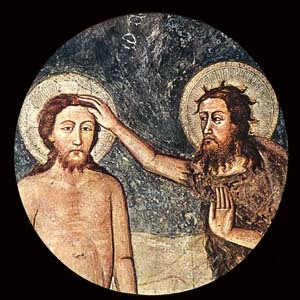 Saint of the day: Shortly after he had baptized Jesus, John the Baptist began to denounce Herod Antipas, the tetrarch of Galilee. Herod had divorced his own wife and taken Herodias, the wife of his half- brother Philip and also his own niece. John the Baptist declared, “It is not lawful for you to have her,” so Herod threw him into prison. Not only did Herod fear John and his disciples, he also knew him to be a righteous man, so he did not kill him. Herodias determined to bring about John’s death. From prison John followed Jesus’ ministry, and sent messengers to question him (Luke 7:19-29). One day Herod gave a fine banquet to celebrate his birthday. His entire court was present as well as other powerful and influential Palestinians. Herodias’s daughter Salome so pleased Herod when she danced to entertain the company that he promised her whatever she would ask–even half of his kingdom. Salome asked her mother for counsel and was told to request the head of the Baptist (Matthew 14:1-12). 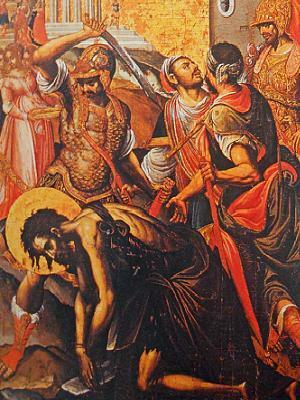 Because of his pride Herod, though deeply sorry, could not decline the request; thus, as Saint Augustine says, “an oath rashly taken was criminally kept.” He sent a soldier of the guard to behead John in prison. Thus, the “voice crying in the wilderness” was silenced. The head was placed on a platter and taken to Salome, who gave it to her mother. Jesus said: “Woe to you, scribes and Pharisees, you hypocrites. You pay tithes of mint and dill and cummin, and have neglected the weightier things of the law: judgment and mercy and fidelity. But these you should have done, without neglecting the others. Blind guides, who strain out the gnat and swallow the camel! Reflection on the gospel reading: Religion that is spiritual has been the underlying theme of the gospel readings for several days. Nowadays, we hear a lot about people who do not consider themselves to be religious but still think of themselves as being spiritual: they do not subscribe to any ritualism or organized religious discipline but they still strive after a sense of connectedness with the world of spirit, whether those connections are with invisible reality or other people. In general, spiritual–but not religious–people are repelled at what they see as straining at a gnat and swallowing the camel: that is, they are put off by the devout who are preoccupied with petty ritualistic and legalistic rigors, but fail at introspection, compassion, and faithfulness. I don’t think Jesus would be insensitive to the plight of spiritual but not religious people. Jesus doesn’t hold back on his expression of disgust at scrupulous religion which is only skin deep. But Jesus in this gospel passage does not counsel abandonment of the exterior practices. I think it’s because Jesus understood that we are what we do. A spirituality which is disembodied, that is, a spirituality which does not include outward physical actions, is hard to maintain. There is no unmediated experience of the divine, and as embodied beings we need to cultivate an embodied spirituality. It is worth noting that Jesus does not condemn a heartfelt attention to the rigors of religious practice. But what he does ask of us is that whatever our external practices, we pay the greatest heed to the demands of justice, love, and integrity. Religious activities without interiority are lifeless, but spiritual intentions not realized in physical signs are phantasms. 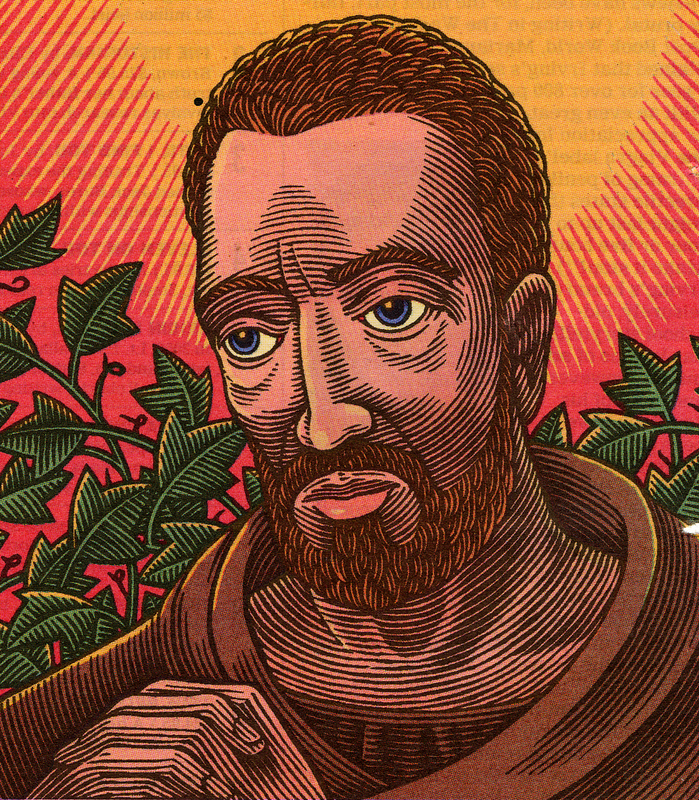 Though Augustine received a Christian upbringing, he led a wild life as a youth and young man. Augustine gives an account of his spiritual development in the first nine Books of the Confessions, a work that has engrossed readers for 1,600 years and are as fresh and immediate today as when they were written. As a nineteen-year old student at Carthage, he espoused the Manichaean heresy, a form of Gnosticism founded in Persia in the late third century, which claimed to be a religion of reason as contrasted with Christianity, a religion of faith. Manichaeism aimed to synthesize all known religions. Its basic dualistic tenet espoused two equal and opposed Principles (“gods”) in the universe: Good (Light/Spirit) and Evil (Darkness/Matter). After nearly ten years as a Manichaean, Augustine, who taught in Milan, visited Ambrose, Bishop of Milan, became a regular attendant at his preaching, and through his influence became convinced that Catholic teachings are true, and that Jesus Christ is the only way to salvation. Still, he found himself conflicted between his desire for spiritual truth and physical release. Augustine returned to Africa in August 388, and, with the objective of living a life of poverty and prayer, he sold his property and gave the proceeds to the poor. Although he did not think of becoming a priest, during a visit to Hippo, as he was praying in the church, people suddenly gathered around him and persuaded the bishop of Hippo, Valerius, to ordain Augustine. He was ordained in 391, and in Tagaste, established a monastery, and preached against Manichaeism with great success. When he was forty-two, he became coadjutor bishop of Hippo, where he was bishop for 34 years. During his years as bishop, Augustine combated the Manichaean heresy, strongly affirming free will and expounding on the problem of evil; he struggled against the Donatist heresy that attacked the divine institution and hierarchical nature of the Church. 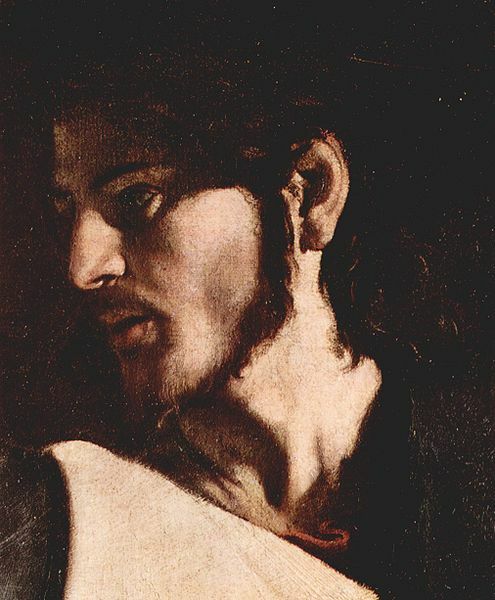 In later years, he would confront the Pelagian heresy that denied the doctrine of original sin and the effects of grace; and the heresy of Arianism, which denied that the Son is of the same substance as the Father. 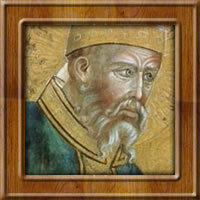 Augustine died August 28, 430 at the age of seventy-five. His perennial contribution to and influence on Catholic doctrine and thought and on Christian belief and piety is incalculable, and his many theological and philosophical works, especially the Confessions and the City of God have continued to captivate and inspire mankind for more than the better part of two millenniums. Do we feel called that we all share in the reign of God? Do we know that we all have a shared responsibility to build up the kingdom? Do we give up when the going gets rough? Friends, I believe that our God has called us out of church to be church, not only to ourselves but to each other. As Paul praises the community for their love for God, one another and how that love continues to grow in the daily struggles of life. Our physical places of worship are fine, but do we put all that we have and are into the buildings that we worship in? Do we invest the time needed into ourselves and each other? Do we grow in our love for God and each other? What do we end up making as gods in our life? We know living and being in communities of whatever sort==family, work, friends, and so on–leads us to be challenged at times to see beyond our own world to see the bigger picture that surrounds us. When people react in certain ways, do we say, what is that person going through at this time? More importantly, that should cause me to reflect within and see why did it affect me in that way? Whatever I am going through may be clouding the others pain and I focus on me. It is not always about me! We need to be careful and mindful both about ourselves and of others. We need not take things so seriously and learn to live in the moment. Building up ourselves and others to be good human persons loving and giving for the reign of God. We all have our own practices and rituals. Practices that even I myself have grown up with and have led me to where I am now. I do not regret the experiences: they have helped make me who I am today. One is not better or worse than the other. Conservative verses liberal practices, institutional rules or open, laid-back rules. Does it really matter in the end? To some it does, and that is why we have so many choices in how we worship. For me I am learning to put aside those rituals that block me from being concerned about the individual that I encounter. I find great joy in knowing more about the person who has just embraced me in that moment. I can learn so much from that person. We can see the God of all creation in each encounter. I hope that person and I can see the divine in each other. For me, I hope that I focus on what is truly important and know the things that I may put too much attention on and be careful not to make it a god. As a brief exercise, as we have all done before, make a short list of the important things in your life. Look carefully at what ranks ahead of others. 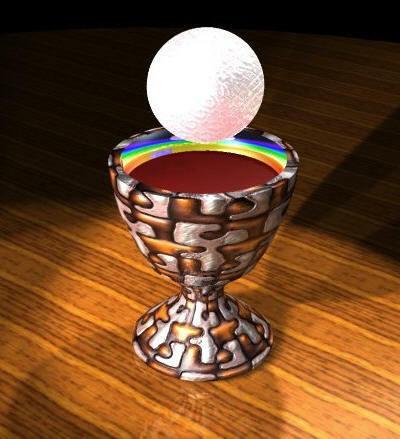 Do we put God in the center placing our family, work, friends, relationships: ourselves on the altar of God’s Love? Jesus said to the crowds and to his disciples: “Woe to you, scribes and Pharisees, you hypocrites. You lock the Kingdom of heaven before men. You do not enter yourselves, nor do you allow entrance to those trying to enter. “Woe to you, scribes and Pharisees, you hypocrites. You traverse sea and land to make one convert, and when that happens you make him a child of Gehenna twice as much as yourselves. Reflection on the gospel reading: It is easy, I think, to read the passage that the Church offers us today and see a condemnation of the Scribes and Pharisees, but it is not these groups whom the Lord condemns but an attitude and a way of thinking. Our Lord’s detestation of falseness and his abhorrence of hypocrisy are apparent in this text. Jesus condemns a way of thinking that corrupts the true spirit of religion, a way of thinking that makes religion a ridiculously hard riddle which is impossible to live and inhumane to enforce. For Jesus, true religion is a matter of the heart flowing out through our lives and actions into the world; it is a continuous outpouring where our insides and outsides match each other. It is a matter of love at the root of our being for the needy and an absolute availability in the world for the emptiness of others. Saint of the day: In 331 or 332 Monica was born at Tagaste, in what is modern day Algeria, into a dedicated Christian family of good social standing. As a young woman, she married Patritius, a non-Christian, who was a modest landowner and a city counselor in Tagaste. Monica sought to live her ideal of a Christian wife and mother with courage of soul, warmth of faith, strength of hope, keenness of intellect, constancy of prayer and meditation on the Holy Scripture, together with a sensible approach to the ups and downs of family life. 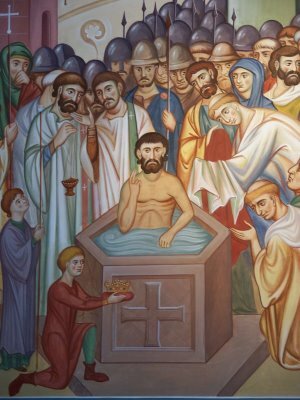 She succeeded in bringing about the conversion to Christ of both her husband and Augustine, “the son of so many tears,” at whose baptism she was present with a heart brimful of joy. On her way back to Africa with Augustine and his friends, she died at Ostia on the Tiber outside Rome some time in the month of October 385. She was 55-years-old. It was about two weeks before her death that mother and son experienced the rapture of the “ecstasy of Ostia,” in which “for one brief moment, with a sweep of their hearts, they reached up to Wisdom, the Maker of all things, and left with him the first fruits of their spirits.” In the 12th century, her liturgical celebration was fixed for May 4, kept by the Augustinians until 1998. The Universal Church, however, keeps her feast on August 27, the day before her son’s feast day. St. Monica’s remains are venerated in the church of St. Augustine, Rome.